We carry a variety of resin statuettes, plaster-cast figures, and trophies. These dynamic pieces come in a wide assortment of subjects, such as military personnel, first responders, sports, eagles, and other wildlife. 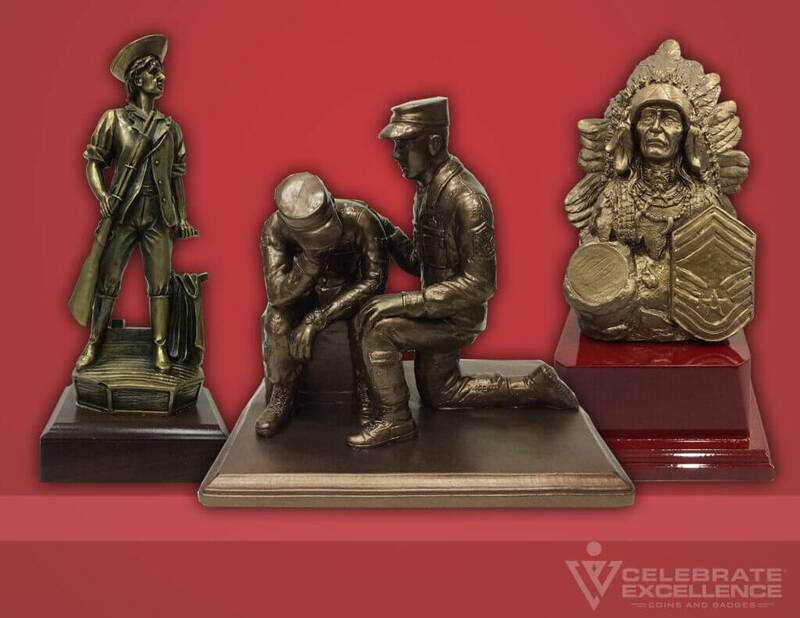 Our popular items include our First Sergeant Statues and Chief Statues, which are unique items totally exclusive to Celebrate Excellence. The First Sergeant Statue, which includes a female variant, was made to honor the important role of the Air Force’s first sergeant. As leaders and counselors, they nurture and prepare the men and women who serve alongside them for the challenges they’ll face as they navigate their careers. It’s not an easy job, but certainly an important one. The First Sergeant Statue shows one such moment, a First Sergeant. consoling and guiding an airman.These statues are very popular as gifts to show appreciation for all the hard work First Sergeants do, and the differences they make in the lives of those around them. These statues are slightly over 10 inches tall, with a wide 11 by 8.5 inch base, which has space for a custom plate. Chief Statues are another of our big sellers, also custom-created and only available at Celebrate Excellence. Achieving the rank of Chief Master Sergeant is a great accomplishment and honor, and our Chief Statues make for a superb celebration of that achievement. This dignified bust of a native american Chief stands just under 14 inches tall, and has a built-in Challenge Coin display slot for increased personalization. It bears the insignia of the Chief Master Sergeant and has space on the rosewood base for a custom-engraved metal plate. The First Sergeant and Chief statues were created by and sold solely at Celebrate Excellence. The figures seen in the statues were taken from a photoshoot we held with the help of with real Air Force personnel, and then sculpted by a local Texas craftsman.